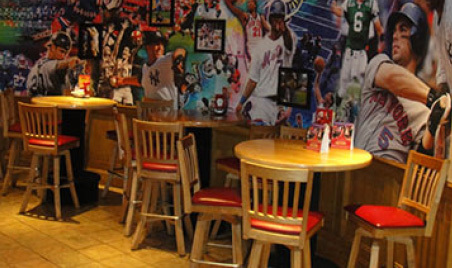 Applebee’s – All Tickets Inc.
Applebee’s is a favorite around the country and the one on West 42nd Street is specially equipped to meet your group’s needs and desires. Dine in or order Grab-n-Go Boxes if you are on the run. Enjoy breakfast, lunch or dinner. The restaurant offers a diverse, always-fresh buffet for each and every meal. You can eat as light or as heavily as you’d like. Try Applebee’s famous Caesar Salad or the lunch buffet with an array of chicken and fish dishes. Your group also can partake of special lunches and dinners. Choose the Big Apple and select four entrées that include chicken and fish, or go with the Best of Times Square and enjoy chicken, steak and fish. Each special dinner comes with Caesar Salad, beverage and dessert. If your group is on a tight schedule, Applebee’s certainly can accommodate you.